Accounting job interview questions will center on the core accountancy job requirements. Carefully study the job description or job posting for the accounts payable or accounts receivable job. This will help you to determine the specific accountancy job requirements and the type of questions you are likely to be asked. We provide some examples of the interview questions you can expect. Use the excellent interview answer guidelines to prepare your own responses to these accounting job interview questions. How many invoices on average do you handle on a daily/weekly/monthly basis? What are the steps you take before you approve an invoice for payment? Focus on your monitoring and checking skills. Demonstrate your understanding of the documentation required for verification before payment is made. Tell me about a recent invoice discrepancy you discovered and how you resolved it. Be specific about the type of discrepancy. Discuss the steps you took to identify and sort it out such as obtaining and checking the original order. Focus on the skills required to resolve the discrepancy such as attention to detail, problem analysis and problem resolution. Accounting job interview questions like this explore your conflict management skills. Emphasize your interpersonal skills, your maturity and your ability to stay calm in the face of difficulty. Describe the techniques you use to diffuse disputes such as asking questions to determine the reason for the dispute, not conveying blame and not becoming too emotional. Demonstrate your ability to work together with others to reach an acceptable resolution. With accounting job interview questions like this first list the applications you have used and then expand on the value of the solutions they offered to your particular business. Look at aspects such as managing vendor information, approval controls and providing payables reports. 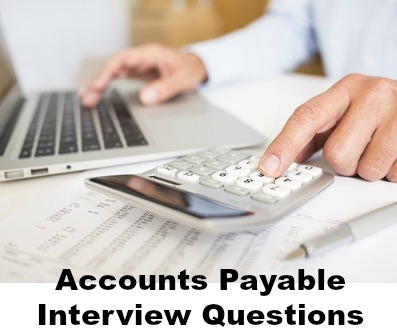 Use this detailed accounts payable job description to help prepare for your interview. Know what is expected in the accounts payable position. 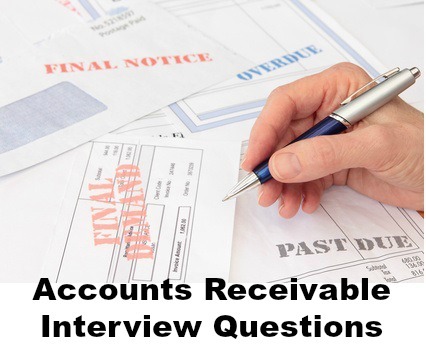 Find accounting job interview questions for the accounts receivable position below. Discuss all your responsibilities. Focus on the skills and knowledge you used to perform these functions efficiently such as maintaining a high level of accuracy, good verbal and written communication skills, strong organizational skills, problem-solving skills, computer skills and a knowledge of accounting processes. Again focus on the skills and abilities you bring to the collections function. Demonstrate how you have used your good interpersonal skills, perseverance, ability to managing conflict, negotiation skills and communication ability for successful collections. What software applications have you used for accounts receivable? List the applications you have used and expand on the value of the solutions they offered to your particular company. Look at aspects such as tracking transactions, assessing late payments, creating past due notices and printing out relevant reports. List the information, make sure you cover everything and highlight your attention to detail. Include a sample of a bill for service that you created in your interview portfolio. What was your average accounts receivable days outstanding? If relevant, discuss any corrective action taken to reduce this figure. What do you consider the most important goals of accounts receivable? These goals will depend on the needs of the organization. Show how you are aware of organizational needs and then identify the appropriate goals to meet them. Demonstrate a thorough understanding of what the goals express and how they support department and company objectives. Common aspects include positively impacting on company cash cycle, increasing cash flow, reducing DSO, reducing bad debt and write offs. What are your strengths as an accounting professional? Try to make your strengths relevant to the job requirements. This list of strengths is a useful resource for answering interview questions about your strengths. This comprehensive accounts receivable job description clearly lists the task and competency requirements for the accounts receivable job. These accounting behavioral job interview questions list the behavioral interview questions that are often asked in accounting interviews. Use the sample behavioral answers to prepare good interview answers to questions that explore the core competencies needed in any accounting position. These include planning and organizing, problem analysis, attention to detail and the ability to deliver accurate and quality work. These finance interview questions explore a wider range of accounting and finance-related skills. Candidates who ask good, insightful questions during their interview are more likely to be offered the job. Use this list of questions to ask to be ready when you are asked "Do you have any questions for us?" Prepare for common job interview questions using this interview question and answer guide. The salary question can be tricky and is likely to come up in your accounting interview. Find out how to deal with this and other difficult interview questions.